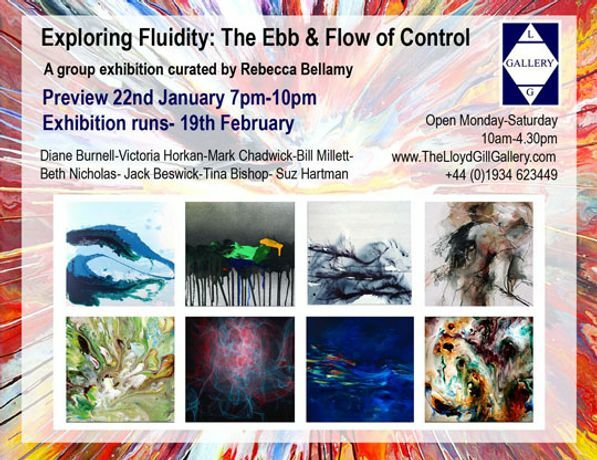 Exhibition runs from 24th January till the 18th February This exhibition presents work by contemporary artists who adopt fluid processes to create purely abstract as well as semi-abstract art. Some of these artists engage in an exploration of aesthetics and process, others are more emotive and expressive. The work to be exhibited is colourful and dynamic; these artists embrace indeterminacy while at the same time manipulating it. Mark Chadwick for example, questions his role as an artist by introducing machines into the painting process to further remove the artist's hand. Jack Beswick interprets the ever-changing, moody atmosphere of the West Irish landscape, while Victoria Horkan and Diane Burnell capture movement and energy through a direct and exhilarating union between artist, medium and surface. Catalogues will be available to purchase and order for 3 pounds at the gallery.